As 2014 comes to a close, so does my year of daily lettering. 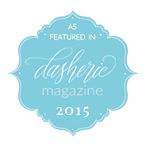 Thank you friends for following along and for your support! This year has sure gone by quickly. Looking back at all 365 entries, here are some of my favorites – I had such a tough time choosing which ones to feature because they all mean something to me. 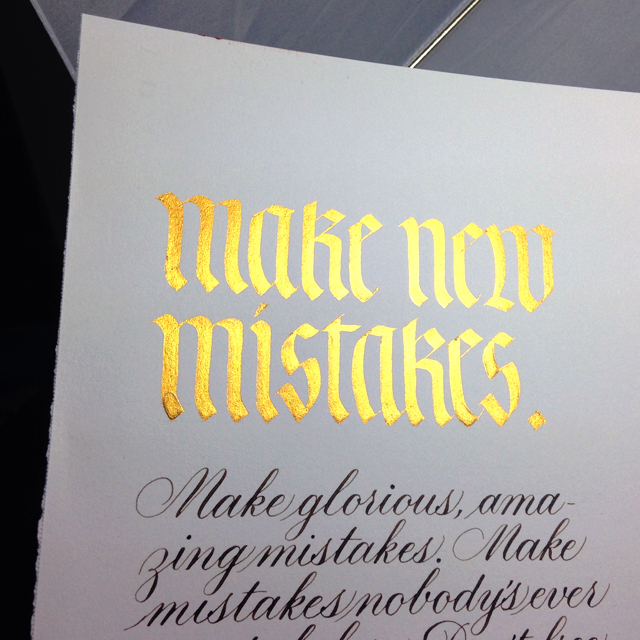 I feel like 2014 was my best year yet, calligraphy- and lettering- wise. 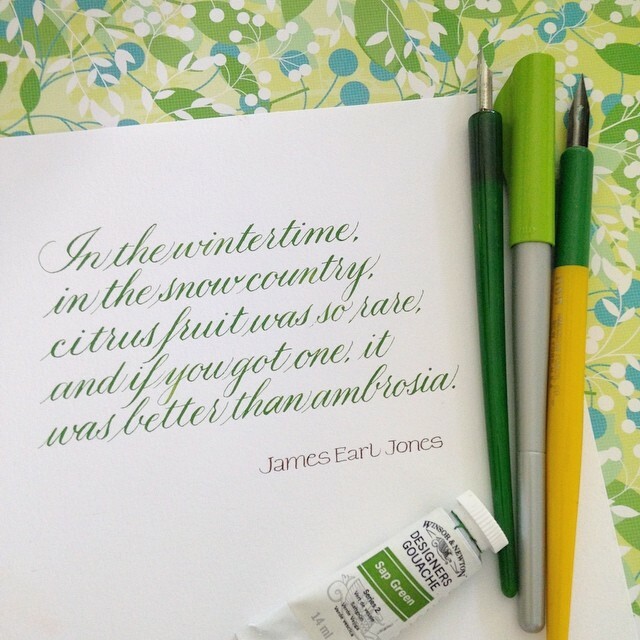 I was inspired by so many artists, calligraphers and letterers online that I just had to try a little of everything! 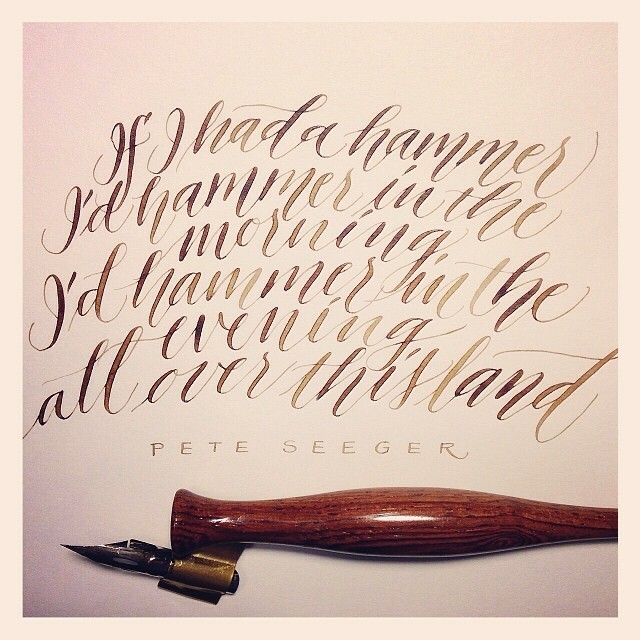 28/365: “If I had a hammer.” Modern calligraphy, walnut ink. Inspired by Pete Seeger (1919-2014). I really enjoy doing this “free-hand style” of modern calligraphy. 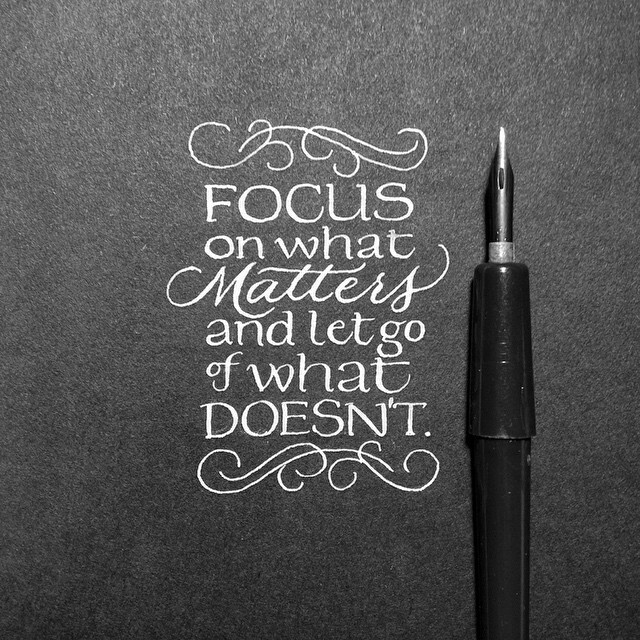 It’s very freeing to just let the pen take you wherever it feels like going. 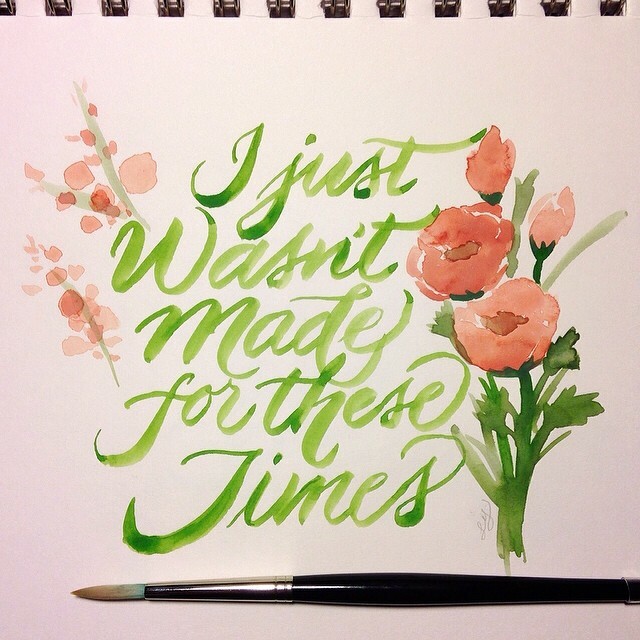 50/365: “I just wasn’t made for these times.” I was inspired to try watercolor brush painting and lettering. 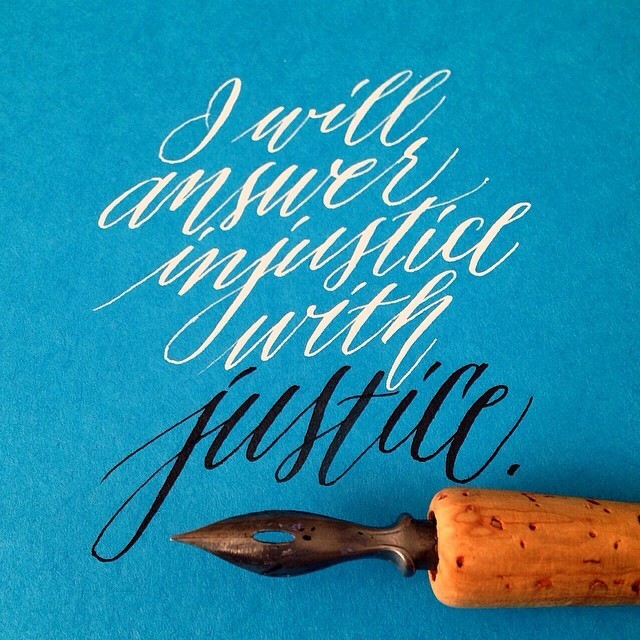 119/365: “I will answer injustice with justice.” Inspired by Game of Thrones. Modern calligraphy, Dr. Ph. Martin’s Bleedproof White and Sumi ink. 195/365: “Roman Candle.” Dr. Ph. Martin’s Bleedproof white. I started working on this modern calligraphy style in the summer and it became one of my favorites. 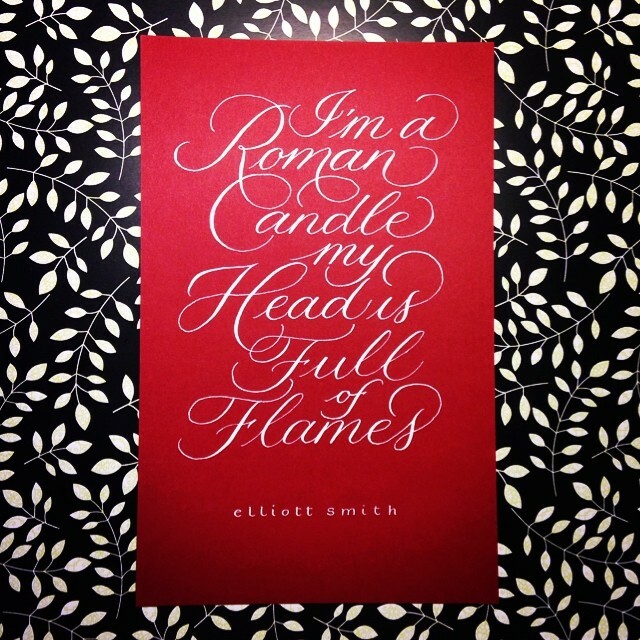 When I submitted work samples for UPPERCASE, this style was all that I sent. I feel that it really captures the song lyrics or quotes that speak to me. 221/365. I also started to practice classic Copperplate more in the summer. 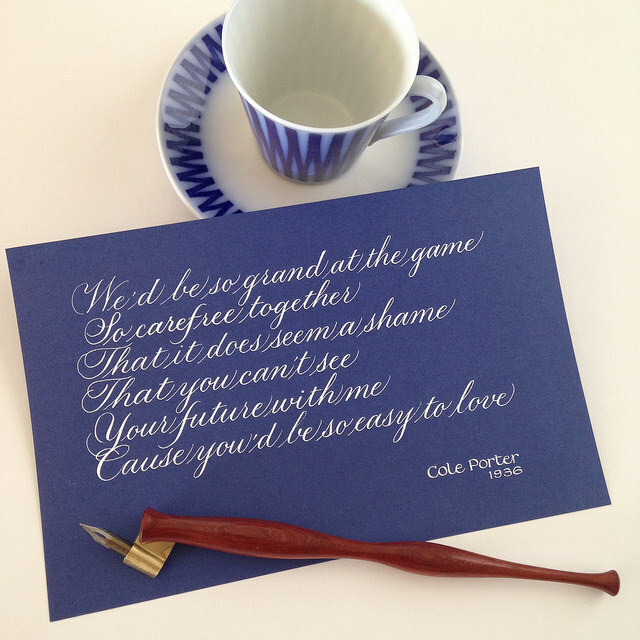 Copperplate script and gouache. 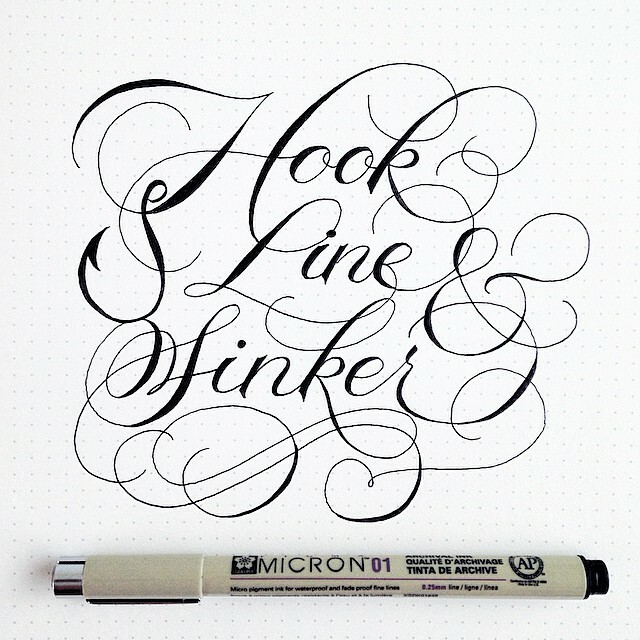 248/365: “Hook, Line & Sinker.” Done with Micron pen. 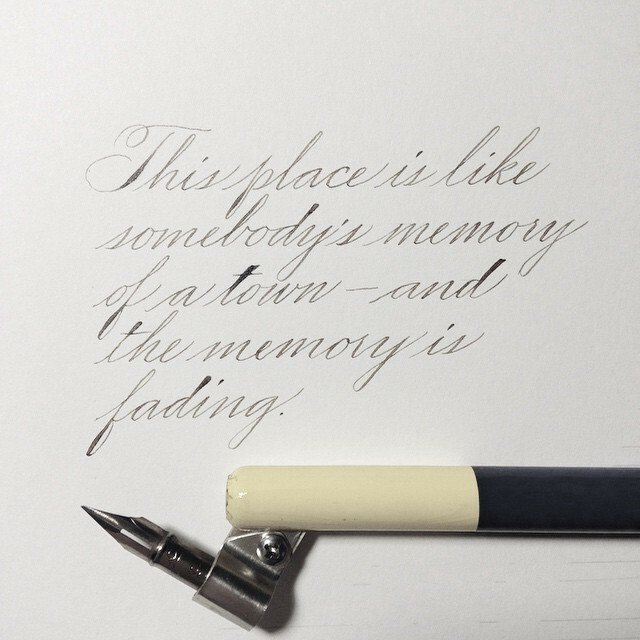 I started taking an online Spencerian class and had to put Copperplate on hold! So I had to do my lettering some other way… this was fun to do, but gosh it’s so much work to do hand-lettering. Kudos to all the letterers out there! 277/365: Autumn is in the air. 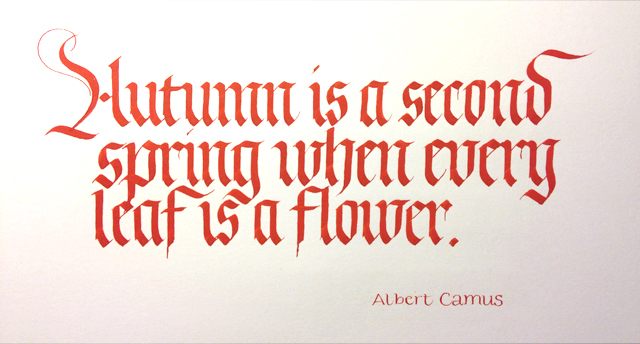 Fraktur, Japanese vermillion ink. I felt my broad pen skills were getting neglected from all the pointed pen work, so I try to do my favorite scripts (Fraktur and Foundational) if I can. Fraktur is just so beautiful. I need to do more of it next year, especially since I’ll be taking a Blackletter workshop with Master Calligrapher Julian Waters in March (can’t wait)! Love that show! And it inspired some Spencerian practice. 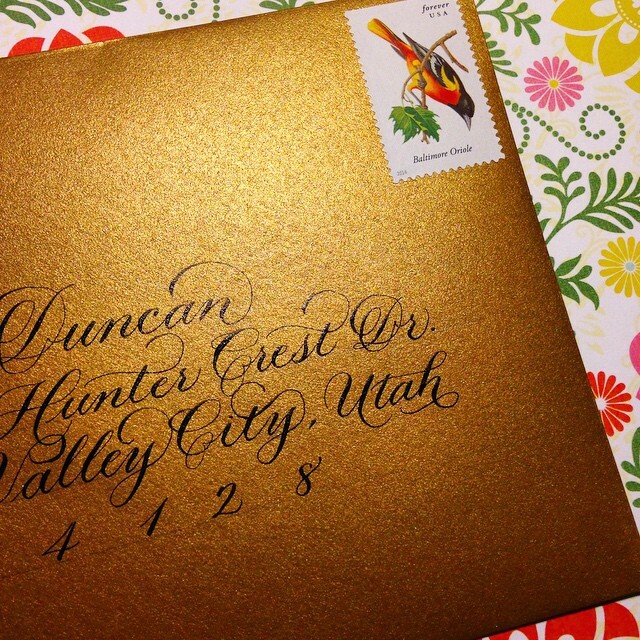 I truly enjoyed the online class with Master Penman Harvest Crittenden. I learned so much from her videos and individual critiques. I started doing some tiny lettering with a crowquill pen in the summer, and a very generous calligrapher friend (thank you, Stefanie!) shared some vintage crowquill nibs with me and I got into it even more! This piece is about 2″ tall. 321/365: “Easy to Love.” Copperplate script, Dr. Ph. Martin’s Bleedproof White. Some more classic Copperplate practice. I discovered how much I love Dr. Martin’s Bleedproof White this year – after trying different types of white ink, I always go back to good ole BPW. It’s the best opaque white and it just can’t be beat. I was laughing so hard when I found an old bottle of it from 199? in my ArtBin from the university days. It still works just fine, by the way! It just needed a bit more distilled water! 357/365: Everything looks prettier in gold. And here are some cards and envelopes from this year’s holiday madness. I designed my cards as early as September this year and had them printed in early November. I used watercolor to paint the rustic garland background, did the calligraphy, scanned them in, and finished the design in Photoshop. I ordered 100 cards and addressed every single one! With personal cards, there’s always room to play with different styles. 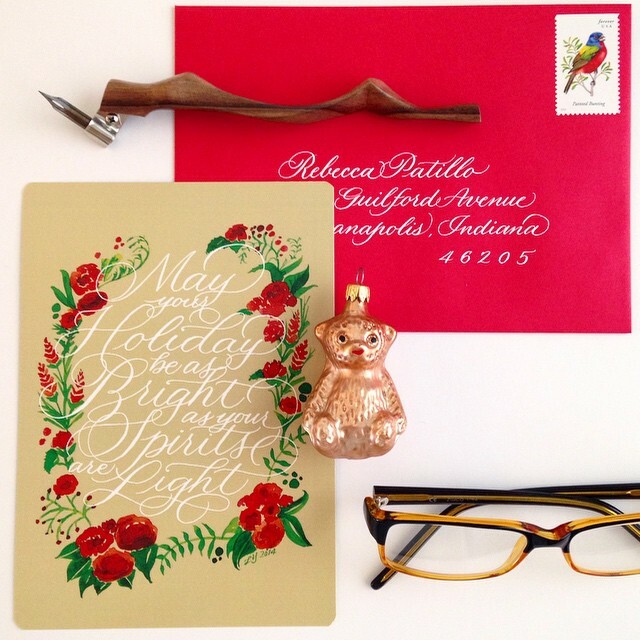 The gold envelope above was one style I started working on in the Fall, which is a more flourished Copperplate. Wonderful quote by Neil Gaiman. Wishing you all the very best for the year to come. Let’s make our mistakes, next year and forever. If you’d like to see all 365 lettering pieces I did, please check out my photo album on Facebook. This entry was posted in Projects and tagged daily, lettering, project 365, recap, year in review on December 31, 2014 by linda. Congratulations on a great achievement. And Happy New Year!! P.S I think my favourites were the black and white 2″ series written with the crow pen – love them!